As I was reading an article on an online news site, I chanced upon an advertisement for a beautiful Christmas tree. Indeed, it was an actual Christmas tree, not a holiday, winter or sparkle tree that celebrates some unknown winter solstice festivity. This letter unapologetically used the word Christmas and the tree actually looked inviting enough to conger up memories of Christmases past. In a nanosecond of Christmas spirit, I clicked upon the attractive image and learned about how I might acquire a similar tree for home or office. The tree, it turns out, is a high-tech artificial pre-lit tree that can be sent to your home in a box, wheeled into your living room and assembled in less than three minutes. Once assembled using its easy-to-use illustrated instructions, you have nothing left to do but activate the lights with the remote control (batteries included) and stand back to enjoy the stunning beauty of your instant Christmas tree experience. It would seem there is no easier way to go on the offensive in today’s cultural war on Christmas than to fill all places with such trees in any of its six varieties and deck the halls with boughs of synthetic holly! Far be it for me to criticize any Christmas tree, real or otherwise. In the present cultural climate, any tree that calls itself Christmas is a victory over politically-correct conformity. However, I cannot help but think that this pre-lit ready-to-use boxed Christmas tree with its “miracle” technology is a fitting symbol of where we have gone wrong in our culture and its celebration of Christ’s birth. We live in a culture of instant gratification where we must have everything right away and effortlessly. This does not only involve indulging in sensual delights but also our experience of wholesome and uplifting things like Christmas trees. In our frenzied desire for instant and effortless mass consumption 24/7, we have engaged in what I call the “frenetic intemperance” of throwing off legitimate restraints and engaging in consumption that ignores those cultural and spiritual values that normally serve to temper and give meaning to life. We have built, it is true, a vast market system that is undoubtedly convenient, plentiful, and inexpensive. Yet, in the process, we have sacrificed that human touch that so delights and enriches us. In the name of maximizing efficiency and increasing consumer convenience, a spirit of dreary sameness descends upon the markets. The result is boxes upon boxes of nearly identical high-tech pre-lit trees that lack soul. It is this human element that is so essential to the traditional Christmas tree. The spiritual act of creating a unique and marvelous tree still leads millions of Americans to buy real trees and decorated them with a hodge-podge of ornaments and lights. It is precisely the time spent together decorating and the extra effort involved that makes the real Christmas tree so special and memorable…and what makes the three-minute pop-up tree so utterly forgettable. This human element also confers authenticity and meaning upon the Christmas tree because it becomes an expression of those who prepare it. It gives rise to the creativity of traditional ornaments and wholesome traditions. In other words, the human element brings about true culture and not the pre-packaged substitutes found in so many of today’s sterile shopping malls..
Of course, our problem is not just Christmas trees but a whole culture of unrestraint that has invaded all fields. It leads to rushed schedules and stress-filled lives caused by our impatience with time and space based on the idea that nothing should stand between ourselves and the objects of our gratification. Tethered to our mobile devices, we are constantly feeding a restless desire for new sensations, stimuli and thrills. When you must have everything instantly and effortlessly, there is the temptation to turn the Christmas season into one more of those sensations. We are encouraged to buy the instant Christmas tree experience rather than experience that special instant called Christmas. Christmas invites us to reflect upon those things that really matter. In a Christmas-tree-in-a-box culture, it invites us to think outside the box. 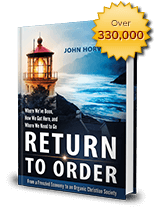 This entry was posted in Featured and tagged America, beautiful, brutal pace of life, false happiness, Family, frenetic intemperance, honor, leadership, marvelous, mechanical existence, Return to Order, rule of money by John Horvat II. Bookmark the permalink.